This week with Wallpaper Wednesday I’m bringing you a bit of pattern. 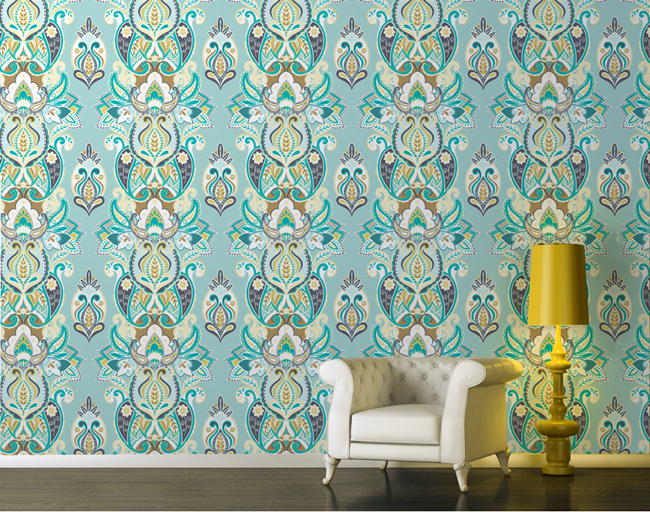 I love the combination of turquoise shades with a hint of mustard in this wallpaper design by Yuyu Design Studio. 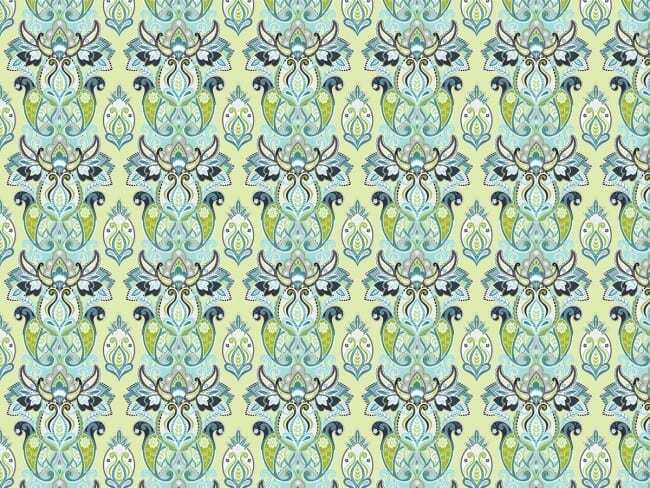 Indulgence Turquoise is a gorgeous mix of decadent shades and pattern reminiscent of traditional damask. Although quite busy I love how this print looks amazing with modern, clean lined furniture as in the lifestyle shot and positioned on one feature wall it could look stunning. Yuyu Design Studio is made up of a husband and wife team combining their skill and creative flair to produce a variety of wallpaper designs that hark back to the 70’s. If, like me you’re a 70s child you’ll be well familiar with retro prints and patterns of this sort. The colours are much more sophisticated that those used back then, and much easier on the eye. Indulgence is available in several colourways if Turquoise isn’t your thing. How about Spring Green? I love that I can see bull horns in this one, can you? Maybe my eyes are playing tricks on me. To make your Yuyu wallpaper experience even more special you can select the part of the pattern you would like for your walls. Available as a wall mural you can either select the presized pieces or enter you own wall dimensions for something unique to you. How brilliant. Available from Wallpapered a 200cm x 150cm piece of Indulgence costs £150. What do you think? Do you love the print or is too much for your walls?